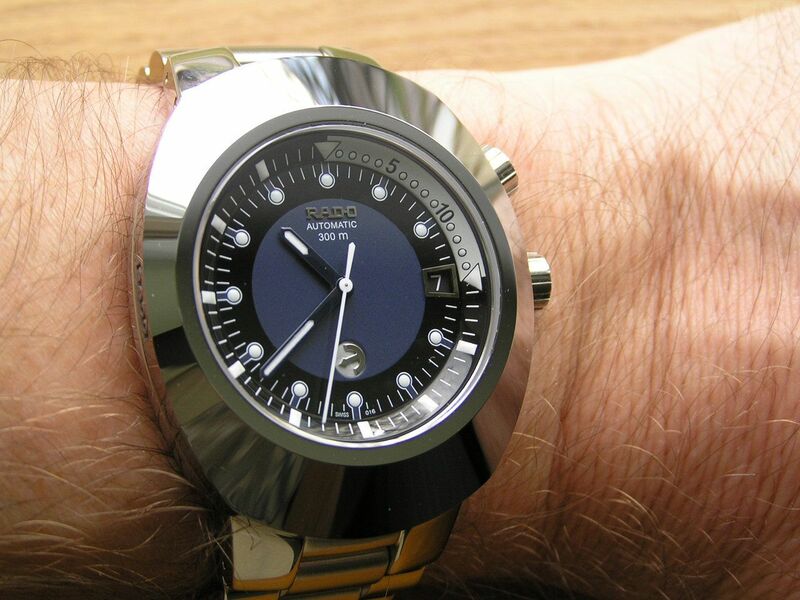 My good WIS friend Paul has compared the Rado watch brand to the automaker Saab. He feels that Rados are quirky, different and run to the beat of a different drum while exhibiting modern design. As someone who owned Saabs for 30 years, I would agree, except that Rados should be compared to Saab pre-General Motors, but that is an entirely different topic and one that I won’t get into here. 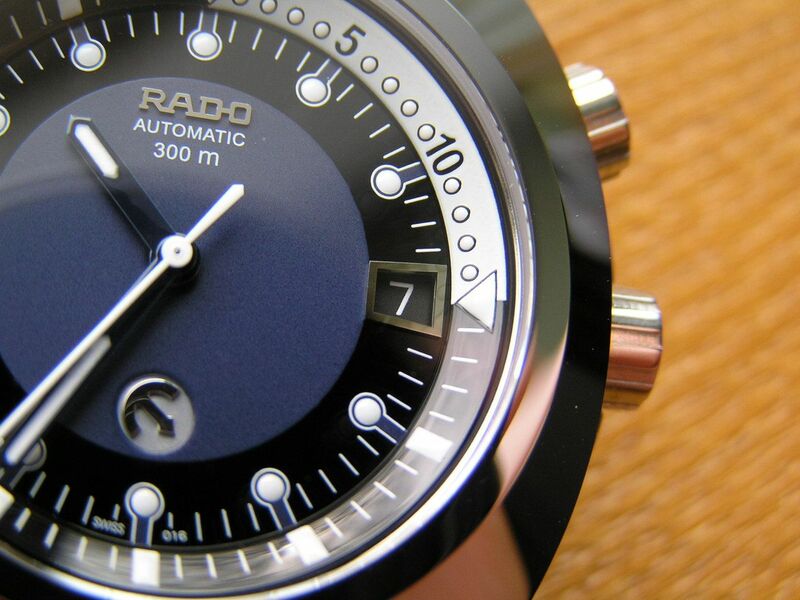 Suffice it to say that a Rado watch is a unique piece of watchmaking expertise. 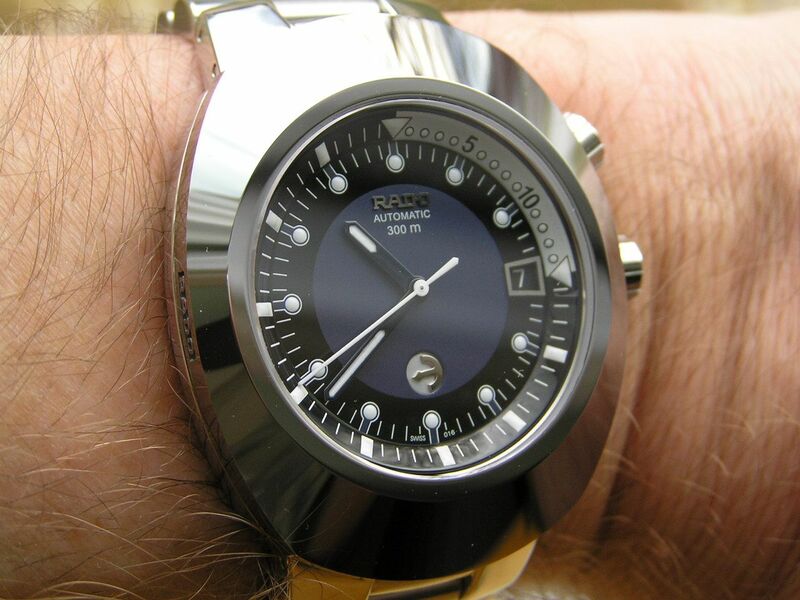 Prior to my acquisition of this Rado Original Diastar, I had just one Rado in my collection, a classic ‘Captain Cook’ diver from the late 60s. 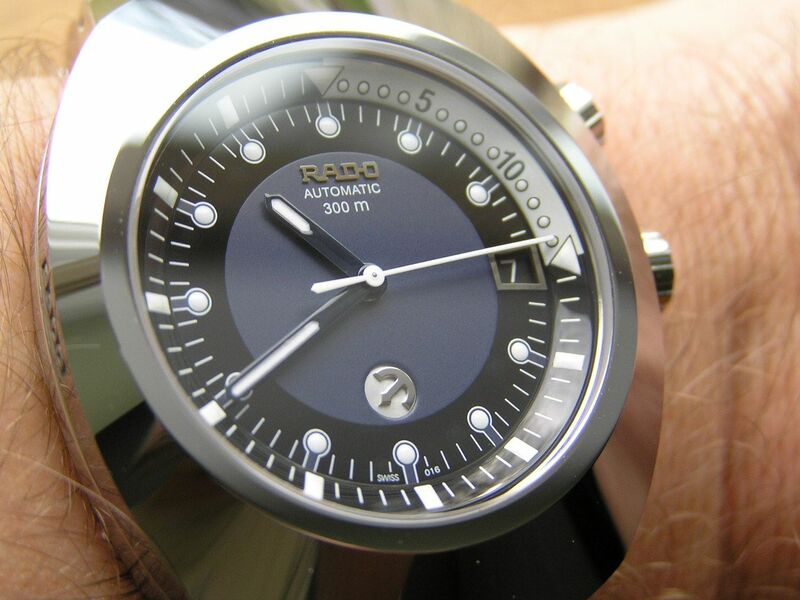 A super cool watch, but one that doesn’t quite convey the quirkiness that Rado is known for. I wanted the icon, the classic Rado, and that would be the Original Diastar, introduced in 1962, just five years after Rado was officially founded as a watchmaker in 1957, after being a boutique clockworks since 1917. 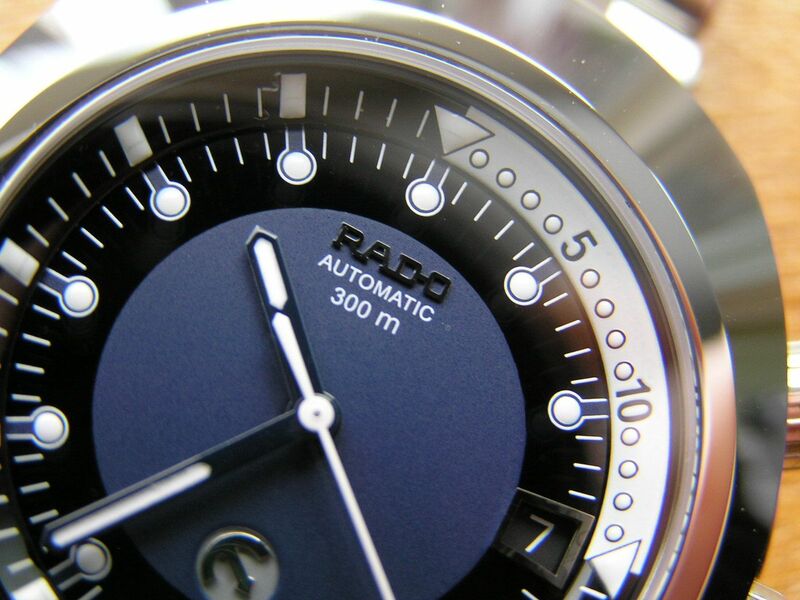 Rado has been part of the Swatch Group since 1983. The Rado Original was billed as the world’s first scratch-proof watch and Rado has carried on this tradition ever since, producing a wide variety of scratch-proof watches and still making an incredibly varied selection of Original styles as well. The secret to the scratch-proof characteristic of the Original is the use of what Rado calls a ‘high tech hardmetal’ bezel. Bezel here refers to the part of the watch that surrounds the crystal, but in actuality, the hardmetal bezel on the Original caps about half the case, for a great amount of scratch-proof protection. The hardmetal bezel is in fact tungsten-carbide, a hard metal on the order of 1400-1700 Vickers on the Vickers hardness scale. 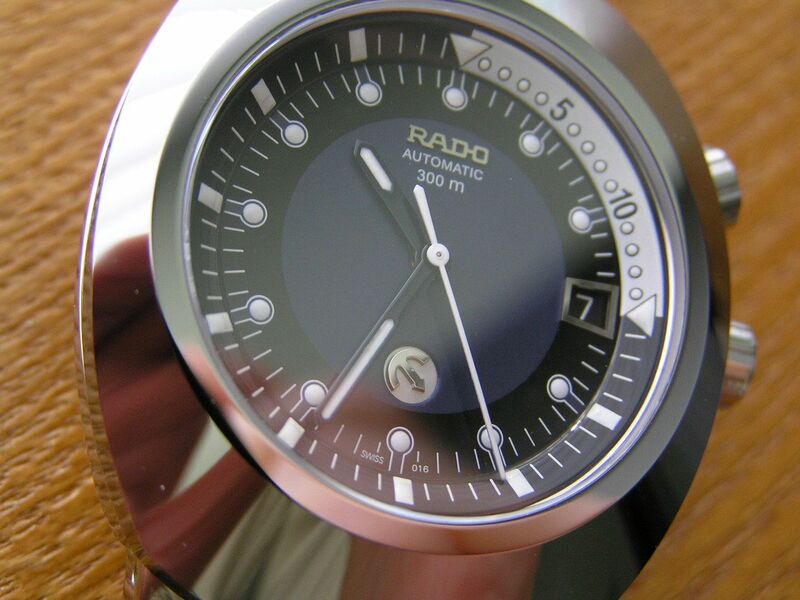 You can visit the Rado web site for more info on how this bezel is formed at the factory and you will get an idea of just how robust it is, as well as appreciating the technology and manufacturing steps involved in achieving this unique component. The hardmetal bezel is highly polished and due to the characteristics of tungsten-carbide, I wanted to point out a few interesting facts about it. The bezel is signed on the left hand side and is also etched with the watch serial number near the lower lug. The actual color of the bezel is a sort of cool, lighter gun metal grey and contrasts slightly with the stainless steel case and bracelet. The contrast is subtle and doesn’t detract from the watch’s aesthetics. 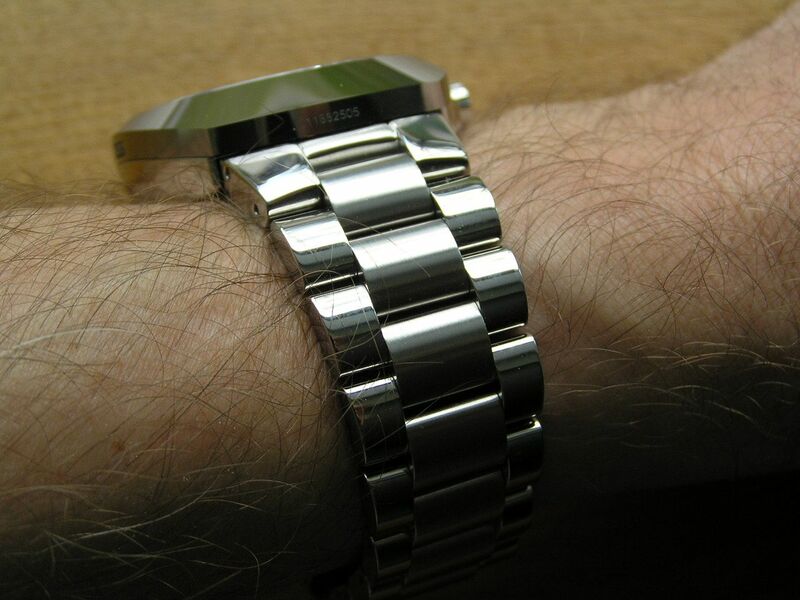 Tungsten-carbide is also heavier than steel, and the weight of the bezel is evident when you handle the Rado Original. I know there are watches on the market purporting to be made entirely of tungsten-carbide and while I have never handled or seen one, I would imagine the weight would be extreme. 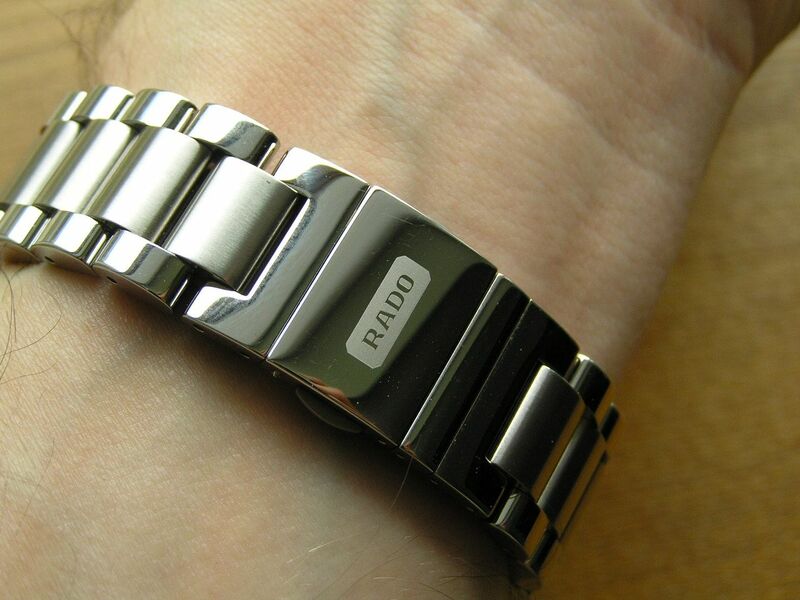 Since the bezel is so smooth and highly polished, it is also a magnet for fingerprints, so if you own a Rado Original and caress its beautiful hardmetal bezel, be prepared to do a lot of wiping clean of the bezel to remove skin oils and fingerprints. Lastly, due to the hardness of tungsten-carbide, this metal, while highly resistant to scratches, is also brittle and if it is struck hard enough or dropped onto a hard surface with enough impact, it can break or shatter into multiple pieces. 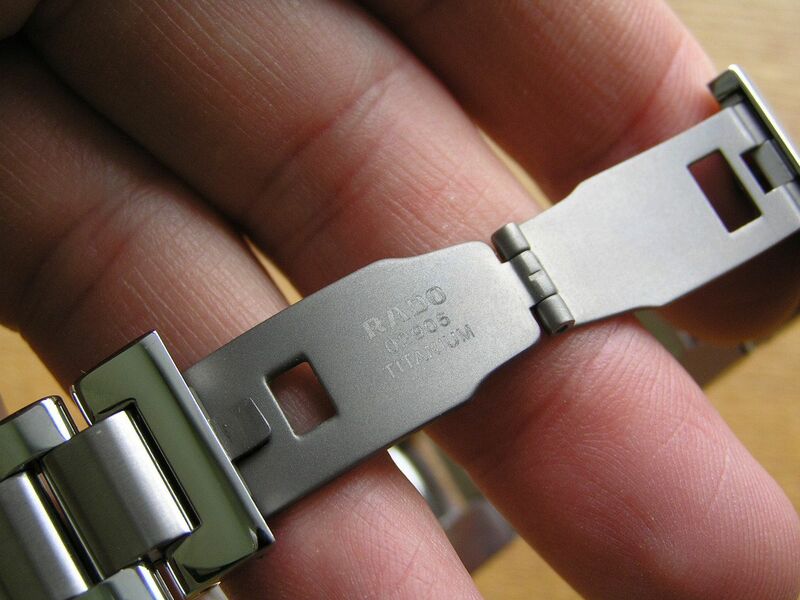 I have seen a picture of a Rado hardmetal bezel that was broken into several pieces. Although I do not know the details of the impact, it illustrated the one negative aspect of this technology. 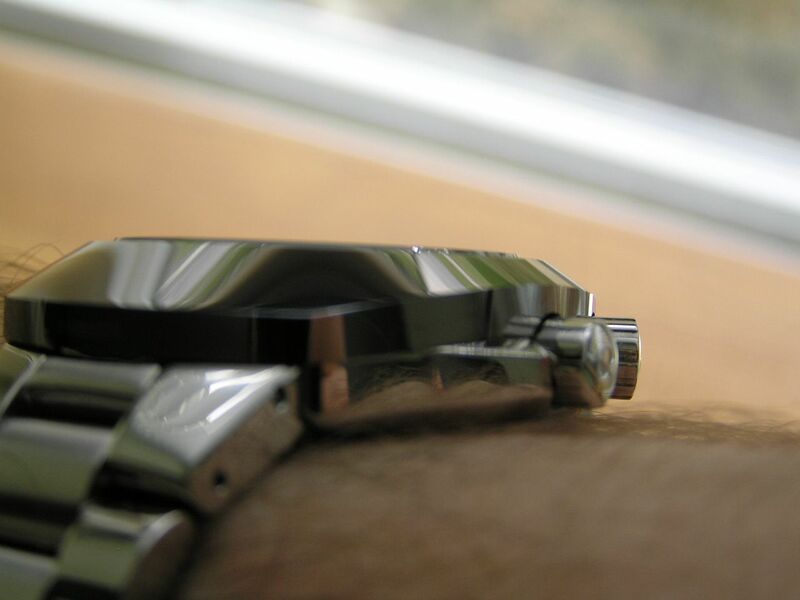 But don’t worry, in normal use, the hardmetal bezel should stand up extremely well to most abuse you can throw at it. 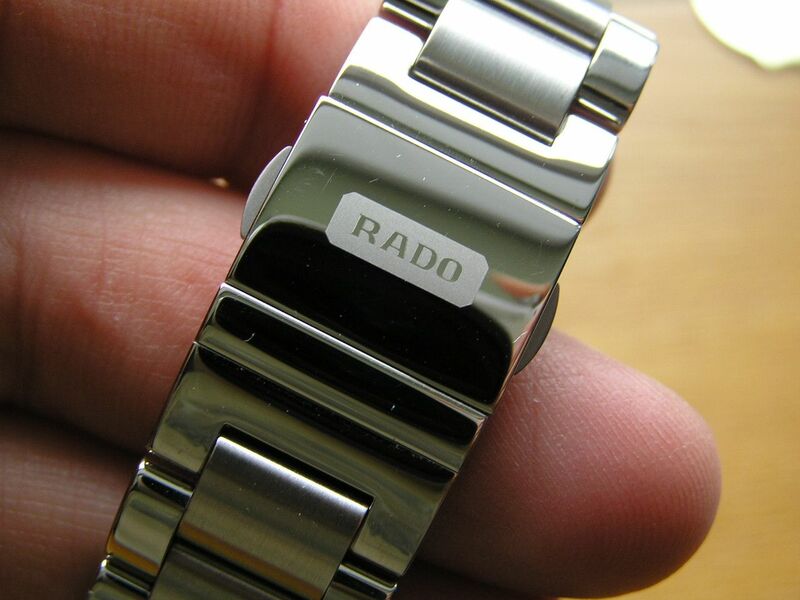 The Rado Original comes in three sizes, ‘S’, ‘L’ and ‘XL’ in their parlance. The Rado Original diver adds 300 meter water resistance and a second screw down crown at the 2 position that turns the inner rotating bezel to the standard Originals features. I love the overall look of this watch and the color combo of the dial, so that’s why I chose it. The case on the Rado Original diver is stainless steel, with the hardmetal bezel pressed onto the top half, for a hunk of pretty serious metal. Both parts of the case are fully polished. The case measures 38.6mm in diameter without crown, 42.6mm crown inclusive. 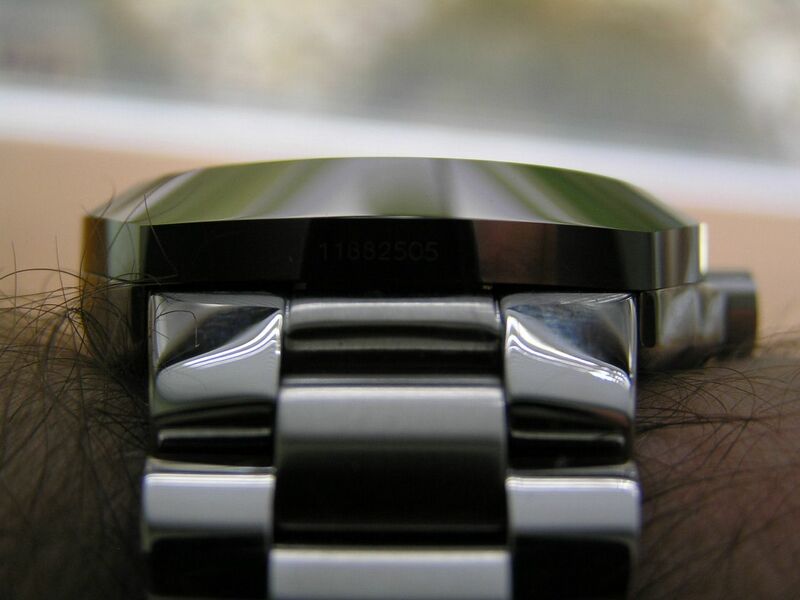 Even though the bezel makes the case shape oval, it is not overly long top to bottom (46mm) and sits well on the wrist. 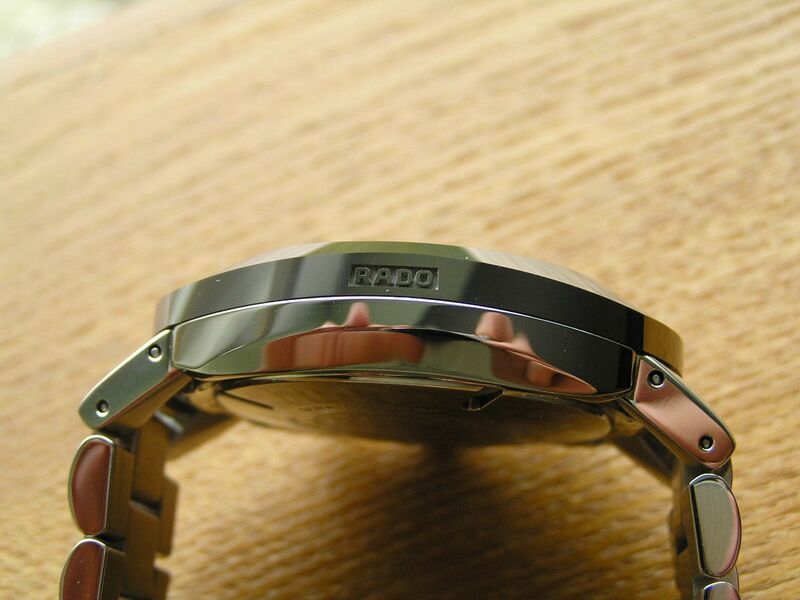 Case thickness is 12.6mm, bracelet width with the bracelet’s semi-integrated lugs measures 24.2mm. I say ‘semi-integrated’ because the lugs actually pivot slightly to hug the wrist better where the bracelet hooks into the fixed center lug on the case. I’m usually not a fan of integrated lugs, but this design works much better for me and I would refer to it as a hybrid design. 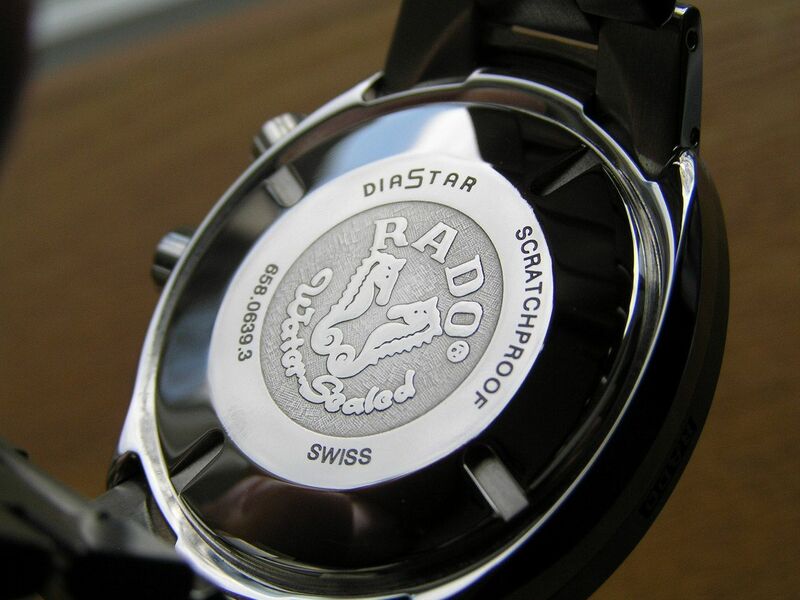 The case back is polished stainless steel, screws down and is stamped with the famous Rado ‘water sealed’ logo. Both crowns are signed with the Rado anchor and both screw down. I do find the main crown a bit hard to use when I wind the watch, as it’s polished and doesn’t have deep fluting, so it’s a bit hard to get a good grip on. The dial is capped by a flat sapphire crystal without any anti-reflective coating. Being flat, the crystal affords a clear view of the dial without any distortion. Overall fit and finish on the Rado Original diver is excellent and is especially good when considering its relatively low price point for such a unique combination of materials. Nicely done. The dial is another focal point on the Original diver. 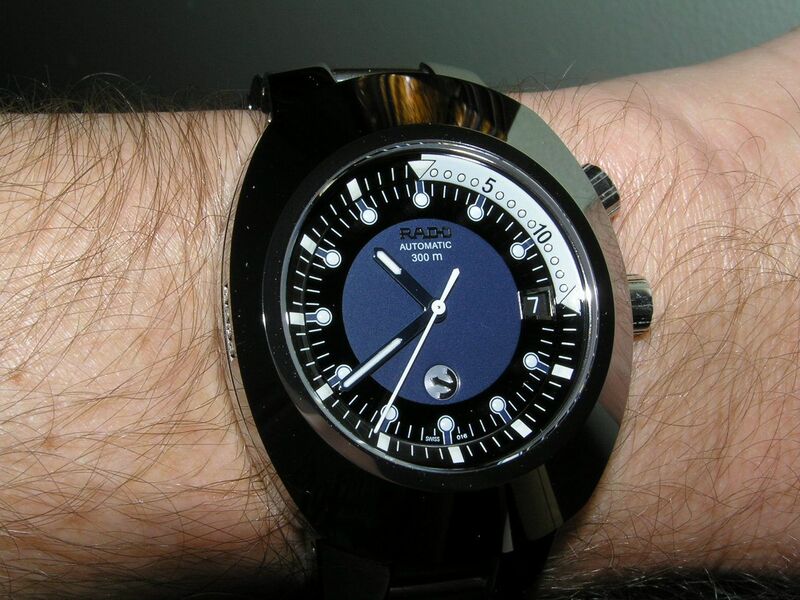 The center is a blue almost vaguely purple color surrounded by a black seconds track which in turn is surrounded by the inner rotating bezel. The bezel is black, with the exception of the first 15 minutes, which is done in white. The hands are done in a dark blue with white inset lume, the seconds hand is plain white (easy to see) and does not have any lume. Lume quality is acceptable, but not super bright, partly because the lumed parts are rather small and narrow, there’s nothing big and bold with lume applied to it. 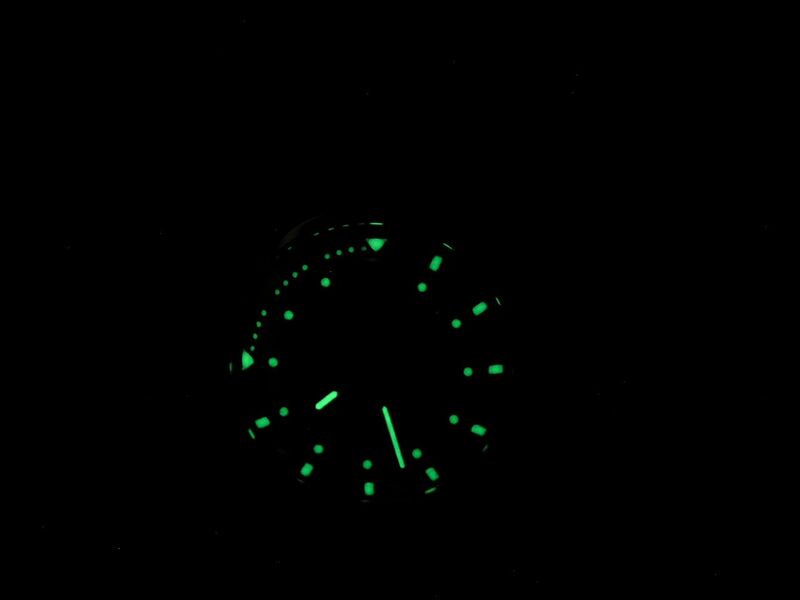 Small round applied lume dots are affixed at each five minute mark, while the bezel has corresponding rectangular lume bars, with small lume dots from the 1 to 15 minute marks and a triangular lume pip at the 12. It’s a legible, clean and good-looking dial presentation. The final dial detail is the classic floating anchor symbol, located at the six position. Sometimes I find myself looking at the anchor first, thinking it is the date window. 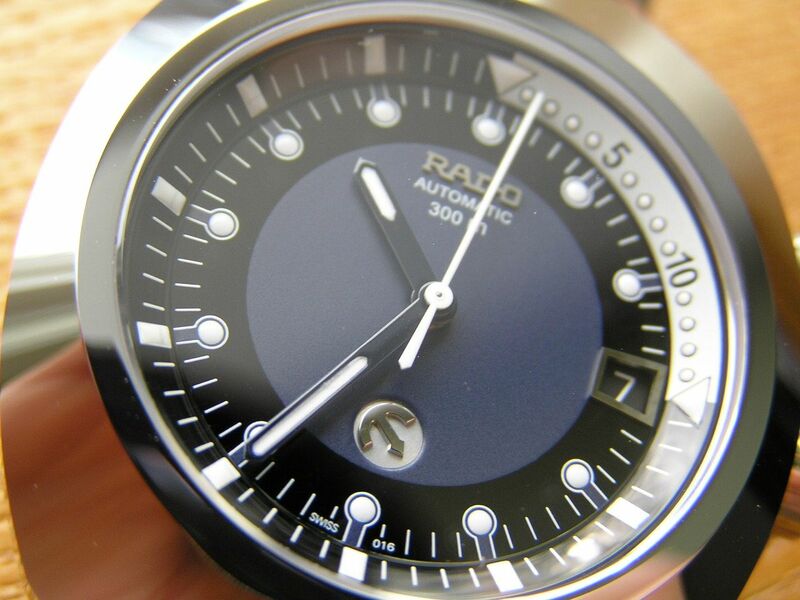 Rado places the anchor on the end of a pin so it floats or rotates with the movement of your wrist, rotating freely in any direction. I always thought it would be cool if the anchor rotated in unison with the second hand, but alas, it does not. Inside the Original diver beats what I am pretty sure is an ETA 2824-2 automatic movement, but I have not opened the back up to verify this and Rado does not list in detail the origin of their automatic movements. Timekeeping has been excellent, running at +4/24 hours. I have only seen 35 hours of power reserve, though, not the expected 42 hour minimum that an ETA automatic should produce, so there may be a slight problem with the movement in my watch, but at 35 hours, it is close enough for me not to mess with. If it would suddenly drop to 24 hours or less, then I would rectify the situation, but for now, the watch remains as-is. The Original diver’s bracelet is a solid link stainless steel oyster style with half-round links. The outer links are polished, the center links are brushed. The semi-integrated end links are solid. 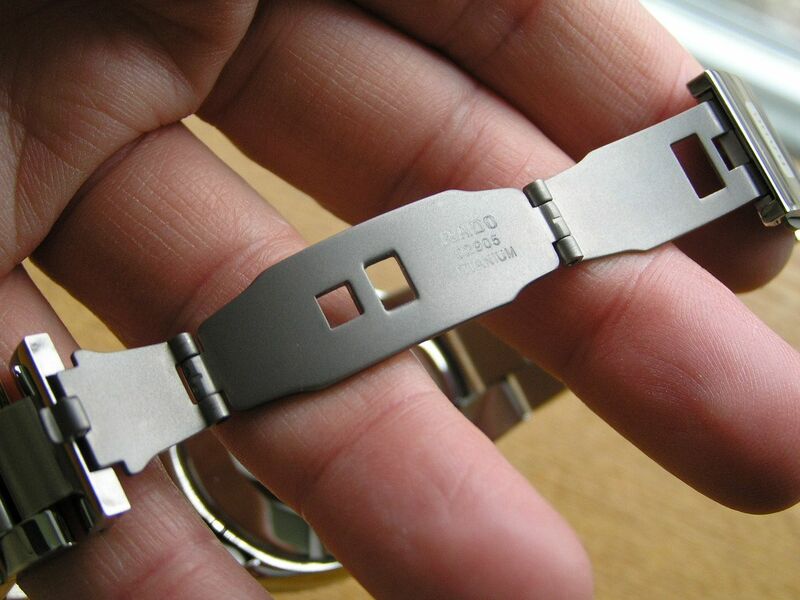 The bracelet measures 24.2mm at the case and tapers to a rather slim 17.8mm at the clasp. The clasp is signed and polished and has a pushbutton closure that opens to one side like a standard deployant, but also has a one-third size deployant on the other side that you pull on to unhook. When open, the clasp looks somewhat like an unequal butterfly clasp, which in essence is what it is. 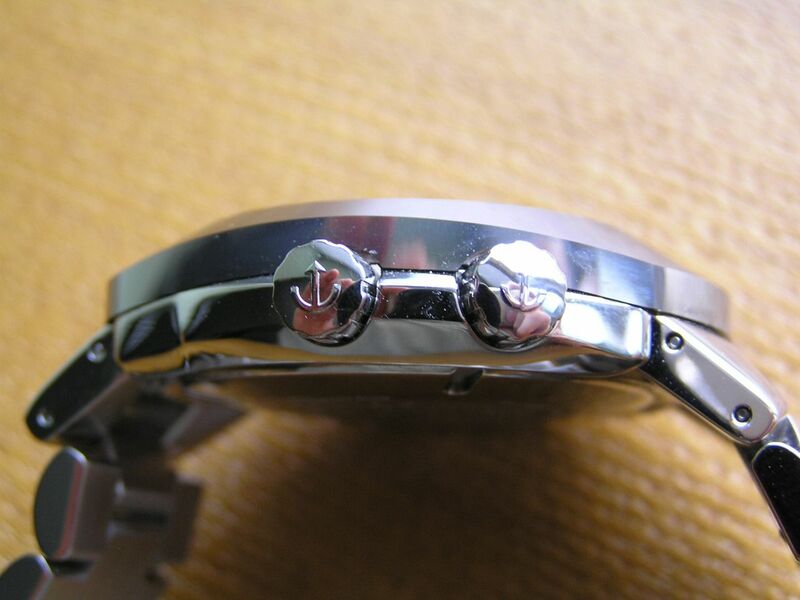 The clasp is stamped titanium, which make this the third metal to be used in this watch’s construction. There are no fine adjustments on the clasp, but the links are not too wide, so at least for me, achieving a good bracelet fit was not a problem. Presentation is a nice, large black box that’s quite heavy and completely in keeping with a fine Swiss watch. 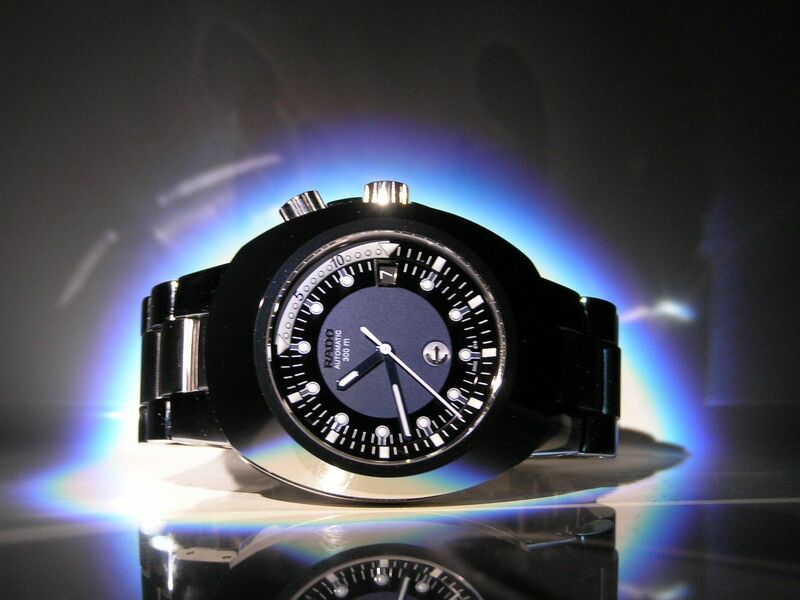 Overall, the Rado Original Diastar Diver is a unique watch that combines iconic modern design elements with a triumvirate of metals and Swiss quality to boot. Thanx for the comments. Does the inner rotating bezel 60 clicks and unidirectional?? I sold the Rado a while back, so I don't have it in person to check out. I do know that the inner rotating bezel does not have any clicks, it just rotates freely and you lock it in place with the screw down crown. I honestly can't remember if it was unidirectional or not, but I believe it would rotate in either direction. Regardless, the Rado was a unique piece and worth seeking out. Great review! Just one mistake there is fine adjustment on the bracelet! The small section on the clasp can be removed for a micro adjustment! Spot on!!! Yes, the small section on clasp is for fine adjustment. It took a bit for me to find out myself. hi i have a vintage automatic rado swass seventeen 17 jewellry adjusted watch thats been broken for a long time. i cant send it to the service or repair shop because of the high fee it would cost me, are there people who buys broken watch for its parts or for salvaging? is there anything i could do about it? Yes, people buy broken watches to fix or for parts. You could sell on one of the auction sites, at a local flea market or just donate it to your local watchmaker. Great read, thanks for the article. This watch become complete with the rubber band that makes it more a sport watch. Had mine for a year and still have no marks and blemishes.